Signs of ongoing construction activity have been detected at the iconic Ryugyong hotel building in Pyongyang, photos taken throughout September show. The activity may be linked to an unconfirmed rumor that there are plans to open parts of the building for commercial purposes. 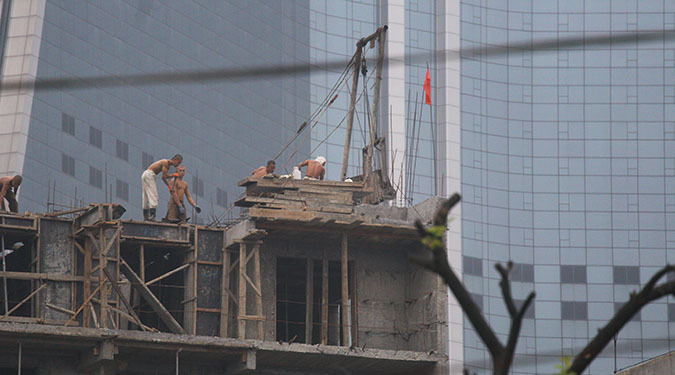 On the south side of the building, a truck and foremen were pictured in late September working on a jetty connecting the building to a boulevard north of the Pothong bridge that had long been blocked to citizens until a wall was notably removed in July. 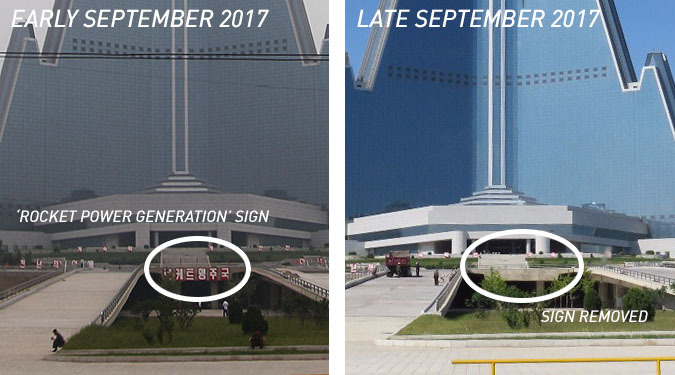 That, and another photo from earlier in September, show citizens can now walk up close to the building’s base, where a propaganda banner which read “Rocket Power Nation” appears to have been removed sometime between the start and end of the month. 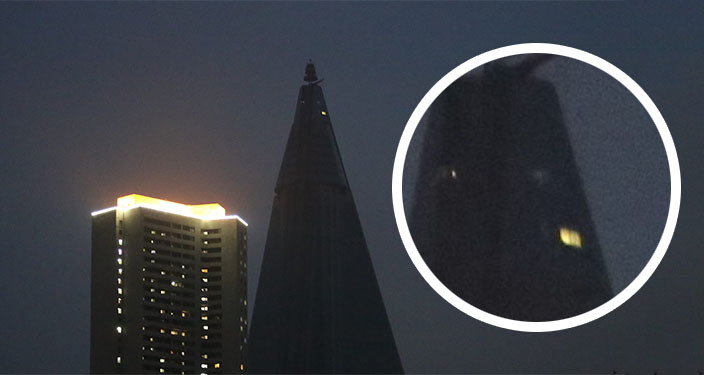 Another photo from early September shows lights on in a room near the top of the tower: roughly the same spot in which three rooms appeared illuminated by night in an NK News video shot in October 2016. “There is something happening at the top,” a regular visitor to North Korea told NK News on condition of anonymity, due to the sensitivity of talking to media. “It’s hard to notice anything during the day but at night I keep seeing dull white lights glowing from the top revolving restaurant,” the source said. 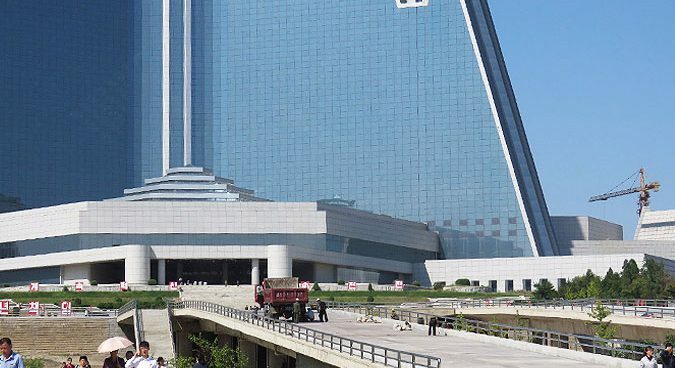 The source added that a rumor is circulating among some circles in Pyongyang that local authorities intend top open multiple revolving restaurants at the top of the hotel, which could explain the lighting there. NK News was, however, unable to corroborate the rumor. In another photo taken on the northwestern side of the building in early September, active construction can be clearly seen on what appears to be a new apartment building. 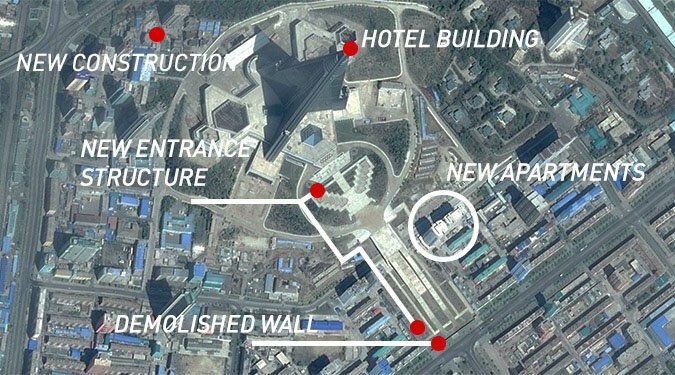 “They’re building two or possibly three hotels around the Ryugyong Hotel which is why there’s a lot of construction happening mostly around the hotel and not actually on it,” said another source about the activity, also remarks which could not be corroborated by other sources. The construction of a new structure taking place on the northwestern side of the hotel comes after the external completion of two new apartment blocks on the southeastern side of the building earlier this year. Future occupants of those two apartments will look directly out at the concrete structure joining the road to the foot of the hotel building. 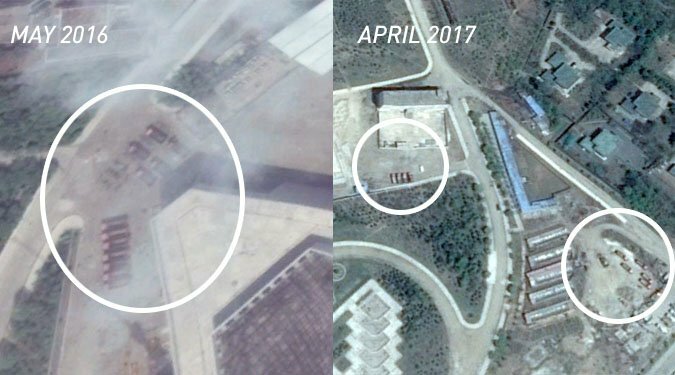 In addition, commercial satellite imagery observable on Google Earth shows a fleet of red color dump trucks regularly appearing in areas adjacent to the main structure from May 2015 to April 2017, when the most recent imagery was taken. 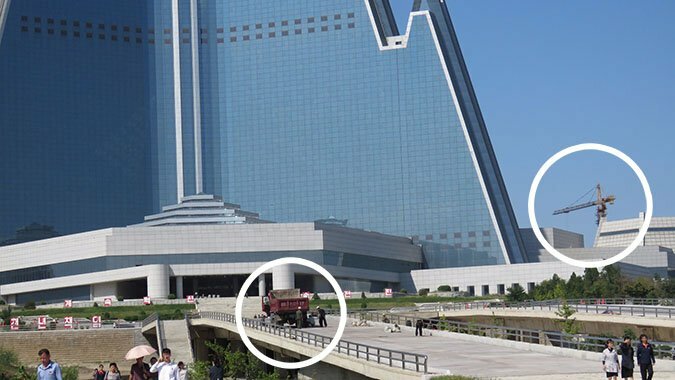 A photo taken on the ground by NK News in spring 2017 previously showed a red Sinotruck dump truck commonly used for transporting aggregates throughout North Korea present in spring 2017, suggesting the vehicles seen in satellite imagery are likely of the same type. 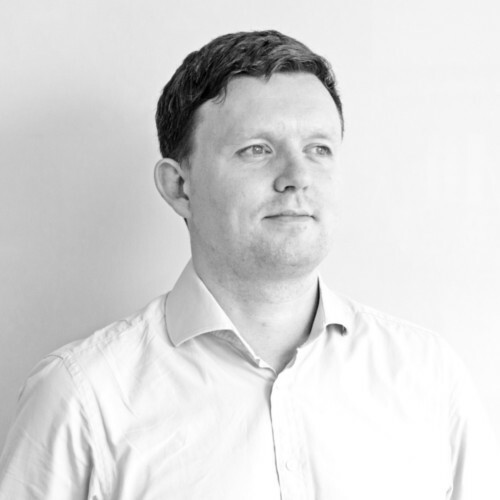 The trucks’ regular presence on the site from at least May 2015 onwards is notable. Orascom completed glazing work on the outside of the building in 2011, which is thought to be when construction was once again halted. After 2011, the only other major development at the site was the addition of the jetty structure around 2013. While signs of life around the building and recent rumors suggest that it is conceivable that parts of the building will soon be opened, there have nonetheless been several similar false-starts in the incomplete building’s three-decade-long history. 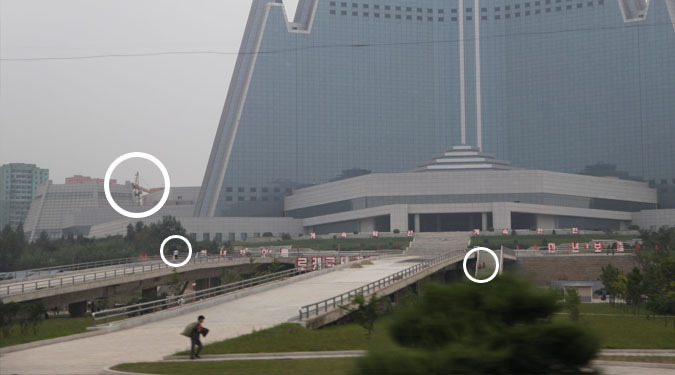 While Orascom was suspected of having spent millions on the building to get it fully-glazed by 2011, photos released by the Beijing-based Koryo Tours agency showed in 2012 that the structure was still empty, without fixtures or furnishings visible.